GO! Outfitters sent me examples of their two flagship hammocks to view: the basic hammock and the jungle hammock. What really stands out with their hammocks is the build construction and the unique fabric tensioning system. The GO! Outfitters basic hammock is very similar in build and construction to nearly every basic hammock on the market, including ENO, Grand Trunk, Hammock Bliss, and others. Key differences include the two-panel construction (verses three panels with most venders) and the inclusion of four symmetric guy points along the long edges of the fabric. These guy points are intended for the company’s intriguing fabric tension system. 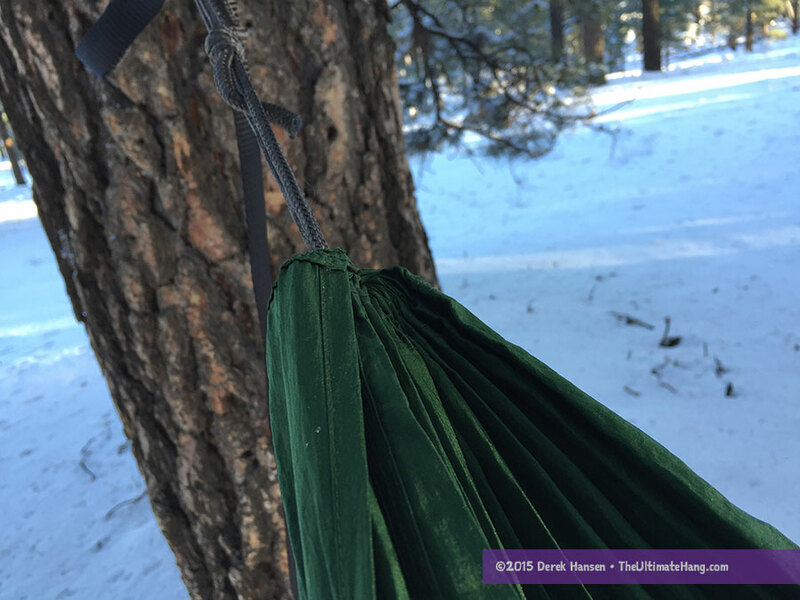 While they don’t explain what they mean by “traditional hammocks,” I’ve only guessed they mean the ubiquitous American rope and spreader bar hammock that is popularized on travel calendars and backyards across the continent. Ironically, these rope hammocks are not “traditional” nor the original design of the hammock as designed; they are modern interpretations of the hammock that came from South and Central America. The GO! Outfitters hammock is really more in line with the true traditional hammocks. In other words, if you’ve been using or are familiar with the ENO, Grand Trunk, or any other hammock vendor, the GO! Outfitters hammock is not going to seem that revolutionary. 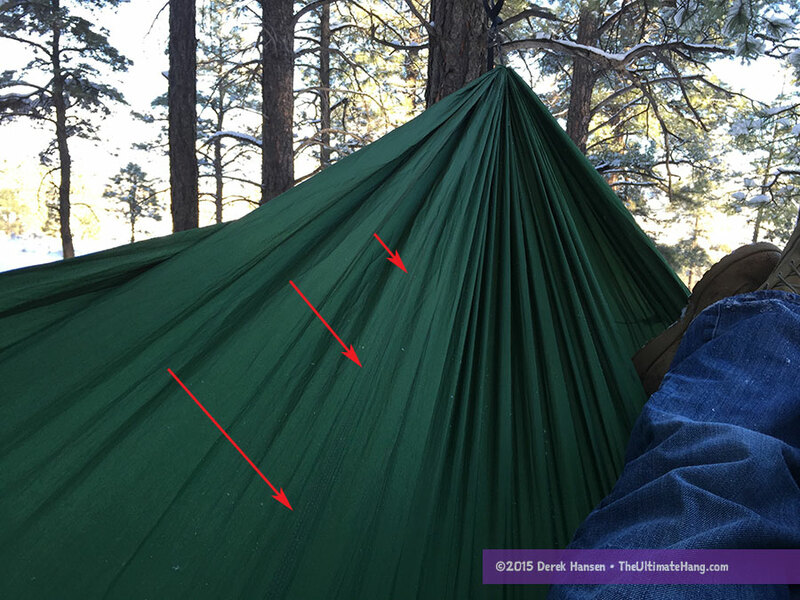 I’ve marked where the seam is located on the hammock. The two panels create rough 80/20 ratio (I measured the short panel at 13 in (33 cm)). That said, GO! Outfitters has made some significant improvements in hammock design that are truly eyebrow raising. First, they broke the mold and went with a two-panel fabric construction. The large, main panel of fabric is generous enough that you’ll find yourself mostly lying in this area. The small fabric panel extends the width by several inches on one side. What’s nice about this design choice is that your head or knees (depending on how you lay on the hammock) won’t get stuck on any stiff seams, which will increase the overall comfort. The second cool feature, and the one I was most intrigued by, was the four asymmetric tie-outs and elastic fabric tensioning system they use. The tie-out points can really be used for a variety of things, including clipping on an under quilt or guying out the fabric using shock cord to the ground. The main purpose is to install the optional fabric tensioners. The tensioners are nothing more than a length of shock cord and a cord lock. They are designed to hang under the hammock and pull the opposite sides of fabric together, thus eliminating floppy fabric in your face, and also creating a sort of foot pocket. On thing to keep in mind: it is easy to get the shock cord flipped or tangled around on the hammock. They still work whether over or under the hammock, but they work best under the hammock. The final winning feature of the GO! 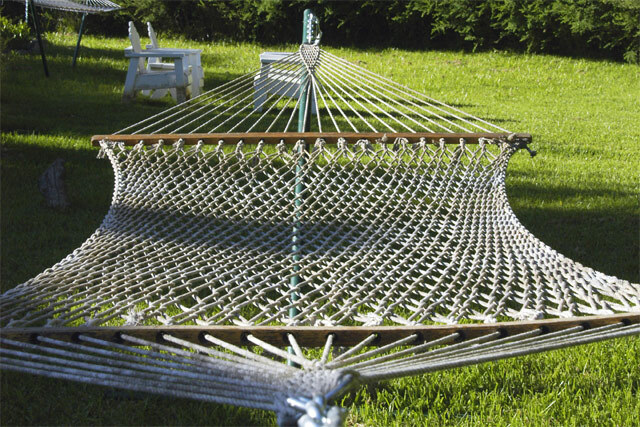 Outfitters design is the overall length and width of the hammock. In my experience, it is the length more than the width that allows for a more comfortable lay in a hammock. Certainly the relationship between length and width are important, but if you have a short and wide hammock, you actually cannot lay diagonally and are forced into an inline, “banana” shape. The GO! Outfitters hammock that I tested is just shy of 11 ft (3.35 m), which makes for a very comfortable lay. What makes hammock sleep flat and comfortable is to hang them with a good sag and to lay diagonally. The GO! Outfitters hammock is not unique in this regard, but they do have systems in place to help ensure you keep a good sag. They sell optional ridgeline rope that prevent the hammock from being pulled tight, which additionally suggests a diagonal sleep position. The shock cord fabric tensioners are really a nice, unique feature, which help most with keeping the fabric from going floppy in your face, and create a foot box. I like the simplified, two-panel fabric design and the overall length. These two design choices really do the heavy lifting to make this hammock more comfortable than other manufacturer designs. I really like the included user guide provided with the hammock. GO! Outfitters has include the best advice for hanging correctly, including a common technique of hanging the head end slightly lower than the foot end. The user guide also covers how to replace the stock suspension and how to get the most out of the hammock. The basic hammock I tested came with the stock rope ends, but GO! Outfitters also sent a cinch buckle and strap conversion kit. I’m a fan of simple rope loops on the end of my hammocks because they provide the opportunity for many different suspension options. I’m not a fan of the inexpensive spring gate steel hooks that come with so many hammocks today. I find that they snag easily on suspension, are clunky, and heavy. Yes, they are strong and do the job, but they were the first thing I removed when I got the hammock. The upgraded cinch buckle system they sell is very easy to use, but I found the webbing a little thick, which makes sliding the webbing more difficult than I had hoped. The good news is that the cinch buckle system they sell is robust and a favorite among veteran hangers, so you shouldn’t be disappointed if you choose that system. On the flip side, the advantage of a thicker webbing strap with a cinch buckle is that it does hold better than a thinner strap. Some thin webbing, if the buckle is twisted or the webbing isn’t aligned, can slip. The thicker webbing has less of a chance to do this. For me, I scrap the hardware completely and use the webbing to tie a slippery Becket Hitch around the end loop on the hammock. No slippage issues and it is easy to tie and untie. The optional ridgeline rope helps set the sag of the hammock but it isn’t a required accessory. In fact, you can use any accessory cord, even military 550 cord, as a ridgeline if you just want to try it out and see if you like it. GO! Outfitters’ ridgeline is non-adjustable, which means they have set the sag to an optimal length, but it may not be the best fit for everyone. 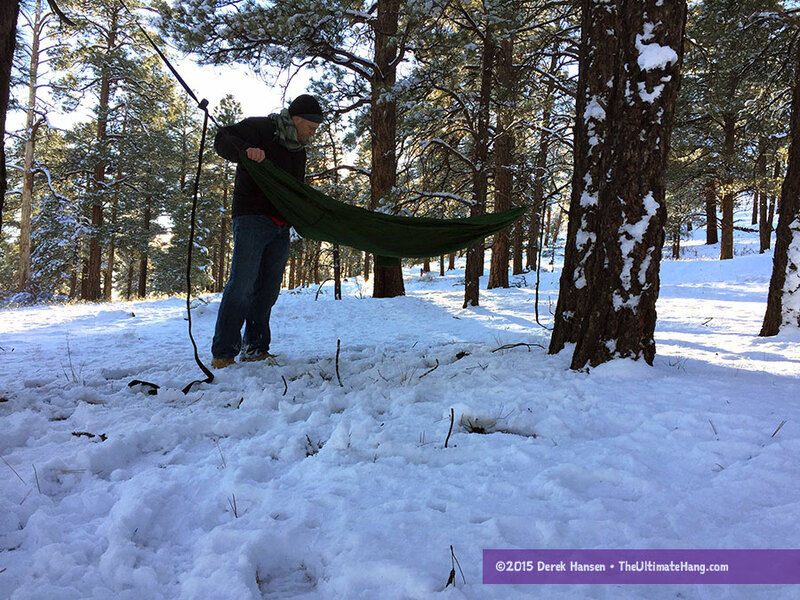 For basic hammocks, I usually recommend an adjustable line at first until you can dial in what works best for you. The line GO! Outfitters sells is high-quality and works very well and is a good starting point if you’ve never used a ridgeline before. The hammock is priced competitively with other “double” parachute nylon hammocks on the market, but with the better two-panel design and included fabric tensioners, help make this hammock a good contender. I wish (as I do with most manufacturers) that GO! Outfitters included some basic webbing straps and suspension with its hammock. I am glad to see hammocks are still evolving and manufacturers are adding additional innovation from what has pretty much behind the norm. Could elaborate on the side tie outs? I enjoy your reviews of these new products!